Several years ago the Chamber implemented the Androscoggin Valley Chamber of Commerce MEMBERS ONLY Gift Certificate Program. Since then it has become an important service to the community and member businesses. The Gift Certificate Program’s purpose is to bolster the economy within the North Country and Great North Woods communities. Chamber Gift Certificates are purchased by businesses, community organizations, and residents as awards for performance, significant contributions, or gifts for special occasions. A list of all participating members is distributed with each Gift Certificate sold. When the certificate is redeemed it is treated as cash, with cash given as change if needed. Once redeemed, the business then returns the certificate to the Chamber office and is reimbursed for its full value. Chamber Gift Certificates are used in place of cash and are made out for $25 each. Approximately $20,000.00 in Chamber Gift Certificates will be sold to local businesses, organizations, and residents this year, which means that much in revenues was channeled back to local businesses! All members are welcome to add their name to the list; the FULL value of the gift certificate is redeemed. 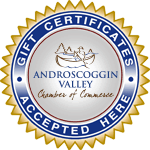 The Androscoggin Valley Chamber of Commerce Gift Certificate is sold ONLY at the Chamber office and is currently accepted at over 40 participating member businesses. Add your business to that list today! If you have any questions about the Gift Certificate Program or are thinking about becoming an Androscoggin Valley Chamber of Commerce member, please do not hesitate to call our office at 752-6060.